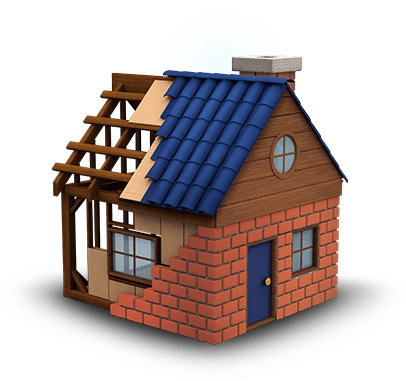 No time to build a website? Our pre-filled websites are a click away from going live. 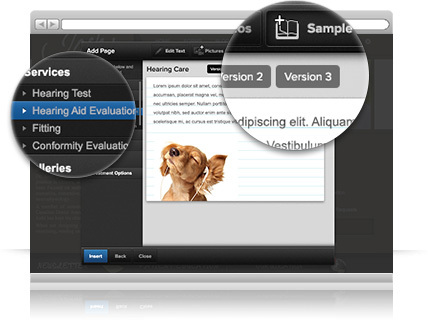 Choose from a library of content variations or edit the content to be completely unique. Your time is precious. Aurisbank Account Managers will add your content to your side for you for easy, stress-free updating. 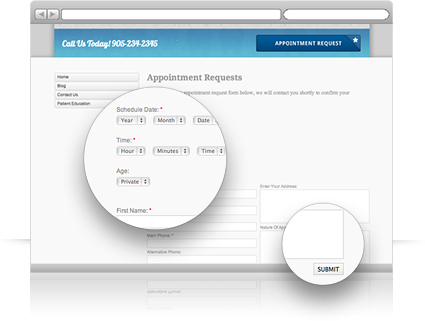 Give your clients the choice of requesting appointments right on your website. A request form will be embedded into your site where clients can choose a preferred date, time and nature of appointment. Your staff can easily confirm knowing they have all of the necessary information to properly book the appointment. 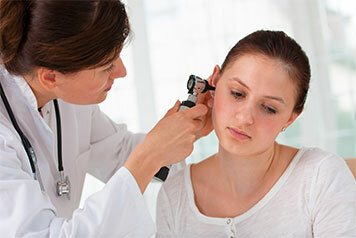 Take pleasure in knowing that you are not only offering top quality hearing care services to your patients but also a reliable, researched library of educational information. 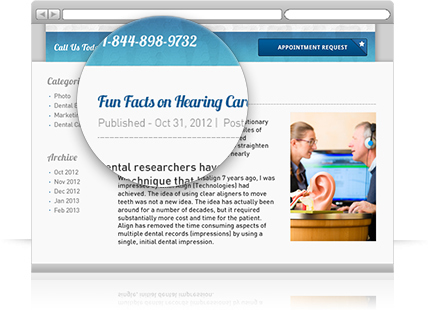 Help educate patients with a variety of articles available on your website. Implementing a communication and marketing campaign doesn't have to be complicated. 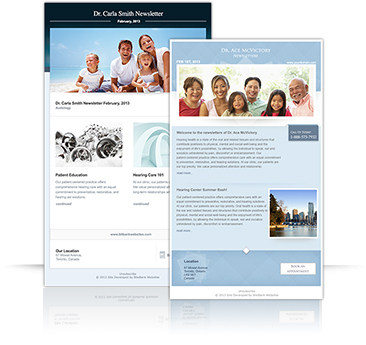 Connect with your clients and keep them updated with our professionally designed E-Newsletters. Add content, photos, fonts and colors to your design and send them to your client base with the click of a button! Save resources by creating several newsletters at one time and scheduling to send them later. Our interactive office gallery makes it easy to showcase your best work and keep your users engage. Provide a virtual tour of your office and highlight your products and services with detailed descriptions. Upload photos through the intuitive content editor or simply send your photos to us and we'll embed them directly into your gallery at no additional charge. Is your website giving you results? Aurisbank tracks your site's online performance with a daily statistical report. 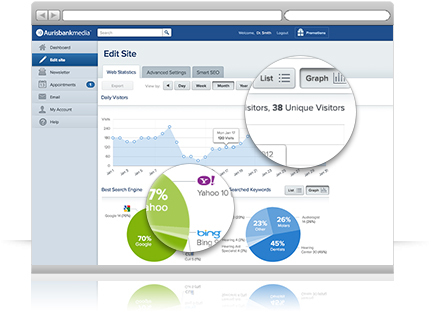 We detail the number of daily visitors, most viewed pages, preferred search engine by your website viewers and much more. Establish your voice with original content and engage with your target audience with your own blog. It's a great way to share practical tips, highlight promotions, showcase your personality and inspire readers to take action. Our integrated blog feature lets you to easily post to your blog through our content editor. Your entire website, from the text and images to the coding that can't be seen in your web browser, are optimized to be read by search engines. Make sure clients can find you with a fully automated, interactive map of your location right on your website. Every page of your website comes with editable pre-filled content so you can get your website up and running within minutes. Save time and money by giving your clients the option to fill out office forms from the comfort of their own homes. Nothing tells prospective patients more about you and your staff than a complimentary testimony from a happy patient. At Aurisbank Media we strive to make sure you have the best possible customer experience. Your dedicated Account Manager is only a phone call away to help you with your web presence. 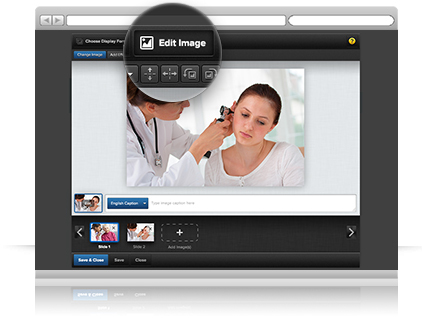 We can even help you upload all of your content and photos directly to your website. 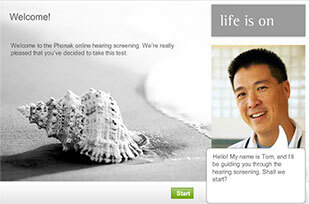 Included with every Aurisbank website by request is the Phonak Hearing Test. Conveniently direct your potential and existing clients to your website where they can try a preliminary hearing test for free! Experience it for yourself here. Make it easy for clients to contact and remember your email with an unlimited number of personalized email addresses, set up at your domain (ex. name@yourdomain.com). 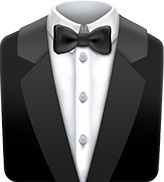 We also take care of hosting all of your email addresses in addition to your website. Google Places is Google's version of a local business directory. When enabled, your Google Places page will include photos, location and contact information as well as a link to your website. Aurisbank Media will ensure your business is listed in this directory to increases your chances of being found through Google search. Every Aurisbank website comes with a basic mobile site. That means potential and existing clients can reach your website with ease whether it’s at home or on the go. Each mobile site matches their corresponding desktop design and is created to keep user experience in mind.